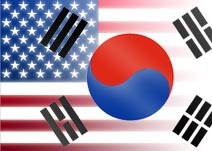 I plan to work this week on a TCS Daily article on the USA-Korean FTA talks. Perhaps I can steal expand upon some ideas from Dram Man's piece. Interesting stuff. Be sure to check it out. 1. It shows that the USA rep. in Korea is not afraid to face anyone, any where, any time. That adds to his credibility and gives a little moral support to those in Korea who support the alliance. 2. By having him on 'their' show and listening to him unfiltered, it forces the lefties to think of him (and the USA) as something other than the caricature that they mentally draw of us in their little echo chambers. 3. If he is prevented from talking, the lefties look like jerks to the general pubic for silencing a different view. If he is not prevented from talking, the lefties either alienate moderate Koreas by talking like jerks or cause dissention in their ranks by talking like reasonable human beings. I like Vershbow more and more almost every day. Mercantilist Economics 101: As the value of the won goes up, Korean-made products become more expensive, which should cause demand for those products to go down. For Korea's export-driven economy, that is a problem. So it Korea under some kind of attack from a secret cabal of foreign speculators who are trying to damage the Korean economy? The won is just closing in on its 'historic value' of 700 to 900 won to the dollar. Despite the best efforts of the Roh administration to help improve the Korean economy, the economy is actually improving. That improvement attracts investors, which in turn causes the value of the won to rise. Just take a look at the graphic I found from this Korea Times piece. 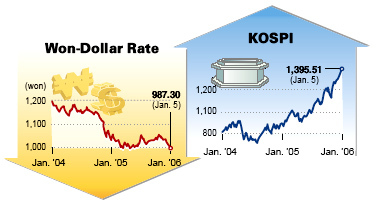 The dollar to won ratio is almost a mirror image of the rise of the Korea's KOSPI stock exchange. It has long been known that the KOSPI was undervalued and an investment-attracting rise was almost inevitable. In any case, we now seem to have a fight on our hands between 'foreign speculators' and the Korean government. Leading investment bank JP Morgan Chase strongly recommends that investors buy Korean won, citing it as one of the most promising Asian currencies, Bloomberg reported Wednesday. “The won is our most favored trade for Northeast Asia because the industrial cycle momentum is fairly strong and the equity market is looking validated,” said Claudio Piron, the bank’s head of Asia foreign exchange research. The won gained 2.3 percent against the dollar in 2005, becoming the fourth-best performer among Asian currencies. It will grow stronger this year to reach W950 to the dollar, Piron predicted. "We are deeply worried about moves in the foreign exchange market that can't be seen as normal," said Kwon, who oversees currency and economic policy at the ministry. "The market has seen an excessive herd mentality because of speculative forces." My money is on the investors, literally. I plan on making a final big student loan payment in March in order to give my new baby the gift of living in a debt-free family. If the won is still strong then I get to keep more of my money here in Korea to save or spend on my family. Come on 950! Baby needs a new pair of shoes! UPDATE: A better place to talk about the article and related issues is the feedback forum at TCS. ORIGINAL POST: Once in a blue moon I write a piece for Tech Central Station. My latest effort talks about the recent APEC conference, Korean anti-globalization protests and the liberalization of Korea's economy. I had to give it a rewrite. The original piece was written before the conference and had obviously become dated. The extra work was worth it because the piece comes with the cool graphic you see on the right. It is certainly much better than the one I got with my previous contribution last July (which was just a bunch of fish). Korea has a long history of civil unrest and one of the most active protest cultures in the world, giving local police and security officials with ample experience in dealing with both peaceful and violent protests. Unlike most countries, Korea has a large force of conscripted riot police (who serve in lieu of military service). That force deals with everything from anti-American riots to violent strikes to fighting monks. So they were ready when the inevitable riots began. Busan provided a venue for two related flashpoints of Korea's modern professional protestors; anti-Americanism and anti-globalization. One of the most popular chants of the rioters was "No Bush! No APEC!" Now go make my editor happy and go read the rest. People involved in North Korean rights groups in Washington say they urged the U.S. government to grant Park’s request for political asylum since they consider him a symbol of internal opposition in North Korea, but to no avail. Despite the U.S. North Korea Human Rights Act of 2004 and its very public pronouncements on the issue, the State Department has yet to grant asylum to a single North Korean refugee. 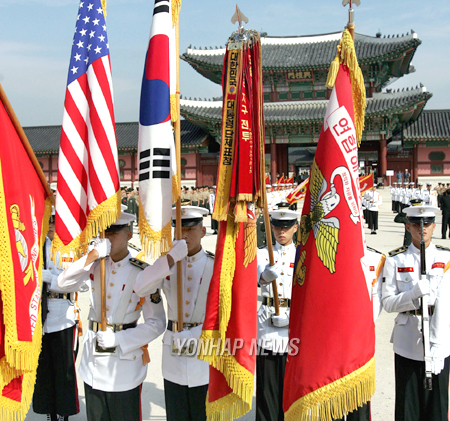 I realize that the ROK has first claim to North Korean refugees (who are citizens of the ROK under Korean law) but Park had requested US asylum and we need to show a willingness to take in North Korean dissidents, if for no other reason than to put pressure on Seoul to do the right thing more often. I would have to assume that there is some quiet arrangement between Seoul and Washington on this matter. "I'm returning to Korea for the first time in ten years. I've lost much during that time, but gained much more in receiving the love of the people. I wasn't a spy," he contended upon his arrival in his native country. But he was met at the airport by Baek Dong-il, a former military attache at the Korean Embassy in Washington who received the stolen information provided by Mr. Kim, according to Mr. Kim's statements to the U.S. Federal Bureau of Investigation shortly after his arrest. "Finally, I feel as if the burden from my chest has been lifted a little bit," Mr. Baek said, sobbing. Let me say for the record that I have no hard feelings for Baek. He was just doing his job and doing it well. But Robert Kim is a traitor and will soon find himself firmly planted in deepest level of Hell (Don't ask me, ask Dante.). I also noticed that Kim plans to return to the USA on November 24. I find it funny that he wants to leave the land where people love him so much and return to the country he betrayed. Can't we deport him or something? New Orleans was briefly liberated from "Racists Koreans." ...Greedy corporations built on the backs of the working poor fled for higher ground, and thousands of liberated wage slaves were free to spend their days in pursuit of intellectual and sexual fulfillment. Food, water, DVD players, and other necessities of life could now be plucked from store shelves like ripe tomatoes, without the obligatory angry glares from racist Koreans. 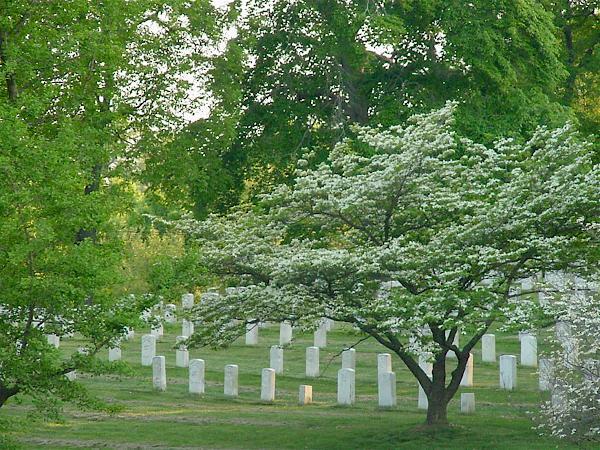 Here is a link to a 2004 photo showing a wreath laid by Our Open Party at the Korean War Memorial.